Two new commanders join in Wave 6, one for each side. Let's take a look at one of them today and see what they each add to the mix. When a friendly ship resolves a command by spending a command dial, if it has not resolved another command this round, it may resolve that command as if it spent a matching command token. If it does, that ship cannot resolve additional commands this round. Supercharger your commands, at the cost of a single command per turn. There's not only power to her ability but also flexibility. Unlike Garm, who adds tokens on Turn 1 and Turn 5, she powers up your command dials each turn, and isn't limited by Command Value how many times she can boost it. Unlike Tarkin, a comparable in cost Imperial commander, she doesn't require every ship to get the same token boosted. Concentrate Fire - Reroll one attack die. Navigate - Change speed by an additional 1. You are specifically looking for ships that will be boosted by that set of abilities. Flotillas, distasteful things that they are, make an obvious answer to the question. 4 Squadrons per flotilla activation (assuming expanded hanger) is a pretty good way to start. 8 squadron activations from 46 points of ships is not too bad at all. The MC80 Liberty, particularly with the title, loves this too. Yavaris loves this as well for obvious reasons. An MC80 or Pelta with Projection Experts can heal the fleet for 2 shields while effectively losing none of their own. Corvettes can repair hull instead of just shields. The Redemption can do it too if you just hate Peltas or something. Small, Red dice ships love being able to add dice and reroll. Salvation, CR90As, Scout Hammerheads, all benefit. The MC80 Liberty loves going Speed 3 to Speed 1 and the other way around as well. CR90s and MC30s love extreme speed changes. Hell, so does the Nebulon B, and I would assume the Hammerhead loves to throttle up to get out of dodge as well. Basically anything not named "Home". Not a bad jumping off point. Leia lets you activate your squadrons between 2 ships, and the Task Force Corvettes add some damage to the party. You can even swap the Flechettes on the one for External Racks if you think you need extra dice. What do you think? How are you going to leverage Leia's powerful, but expensive ability in the upcoming months? Post your best ideas in the comments below! She takes Sato's place as the worst Rebel admiral. The lack of flexibility is just brutal. Too expensive for the drawback she has. Can she use an existing squadron token together with the squadron dial to get an additional squad activation (beyond the ones given by her ability)? 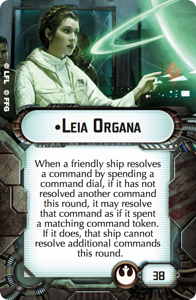 The question of whether or not Leia can combine her ability with an actual token has been the subject of some debate on the forums- Whether that's adding a dice and re-rolling two, getting an absurd number of engineering points, activating squadrons equal to your squadron value+2, or changing speed by 3. The rules don't really say anything about this, since nothing would have caused it before. It will probably get FAQ'd. The wording of the card definitely sounds like the token wouldn't do anything. The effect isn't "add a token to this command" it's "resolve as if" you used a token. "As if" doesn't preclude you from having done the actual thing and isn't additive, so if you spend the actual token Leia's ability just becomes "do what you were already doing".